I have always been enchanted by the orchestrations of legendary arrangers like Claus Ogerman, Gordon Jerkins, Nelson Riddlle, Robert Farnon, Johnny Mandel, Alan Broadbent. As I listened to their music, I found myself in the dreamy worlds. In the history of jazz music, there are many vocalists and instrumentalists who have recorded exceptional albums with strings and symphony orchestras. I have a special place in my heart for music with strings due to playing violin and viola at the conservatory for years. In 1995, I have recorded an album called “For Murat” that featured two tracks with strings. Both pieces were arranged by Kamil Özler, Turkey’s highly respected arranger. My desire to hear more of those magnificent sounds lead me to a recording session with the St. Petersburg Philharmonic Orchestra in 1999. The recording was done at a studio which was converted from a church in St.Petersburg and Erol Erdinç conducted the orchestra. Later, we performed this project at Istanbul Jazz Festival with the St. Petersburg Philharmonic Orchestra in 2000. This was the beginning for my concert series with large orchestras. My next orchestral album was “Therapy” which was recorded in 2009 with Alan Broadbent and London Philharmonia Orchestra at the legendary Abbey Road Studios. The arrangements were again written by Kamil Özler and Alan Broadbent was the conductor. Also, Ernie Watts joined us and he was featured on tenor saxophone. After the recording, our friendship with Alan evolved and his musicianship as a pianist propelled my own musical development. On a trip to New York City, I faint-heartedly showed couple of my original compositions to him and asked; “Alan will you write the symphonic arrangements for these compositions and make my dream come true?” Bill Evans was our common ground and hero. Alan was very receptive and he started working on the pieces. Before I knew it, he had finished the arrangements for the next album, “To Bill Evans”. We recorded this album in Prague with the Prague Philharmonic Orchestra and performed it live in Bologna, Italy with The Arturo Toscanini Orchestra and at the Istanbul Jazz Festival with Deutsche Philharmonie. Performing with large orchestras during these concert series and especially playing with strings made me realize how much I enjoy playing with them. In 2014, I started to plan my next project. I wanted to record this in Los Angeles. I sent my new compositions to Alan Broadbent. I wanted to have Bill Evans’ drummer Joe LaBarbera on this album. I had listened to him numerous times on Bill Evans’ late recordings. Alan suggested Darek Oles for double bass. I had heard great things about Darek and Ernie Watts had also recommended him earlier. 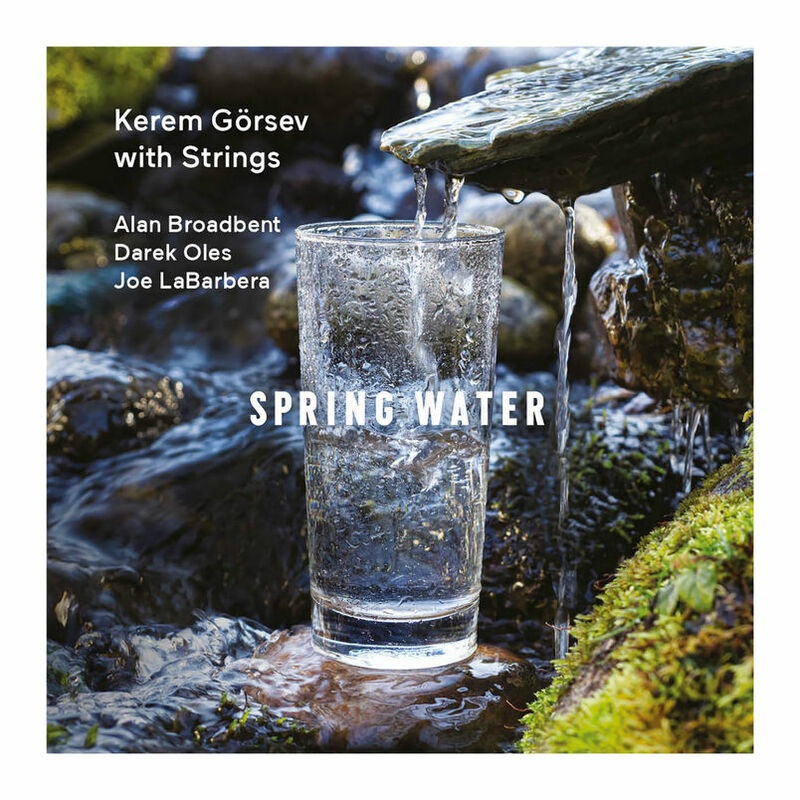 I went all the way to Los Angeles and recorded “Spring Water” at United Records Studios with strings orchestra that was organized by Alan. I always tell myself to take it easy for a while after a big and risky project like this one, but my desire to record with orchestras never ends. Now that “Spring Water” is finished, we are already working towards the next one. Alan has already written four new arrangements and the plan is to record in 2018. I would like to thank Alan Broadbent for changing my path in music and life, the legendary Joe LaBarbera for supporting me rhythmically (preventing me from rushing) and painting a work of art with his brushes, Darek Oles for the excellent solos and his steady and laid-back accompaniment. They all made me so happy! I look forward to recording the next projects with them. Spring and fall seasons have always been very important in my life. I thing of autumn as disappearance and spring as existence. For me, they are transitions from a pastel colored life to vivid one straight out of a Technicolor movie. I dedicated my album, “I Love May” to my wife, Pinar, upon her return from the US in 1995. “Spring Water” also tells a story which is again dedicated to her. “Requiem For Soma” is dedicated to the miners who lost their lives in the mining disaster of May 2014. “Lady Misty” is written for our Bolognese dog Misty, “Mistrust” was written after a betrayal that we witnessed as a family, “Simple Day” is a story of a simple day that I’ve spent. “Weekend” is a jazz waltz that I wrote during a happy weekend, “Marathi Island” is a Greek island that I love and visit frequently and “Innocence” is a composition that I wrote for my daughter Nisan many years ago. The happiest moments of my life are when Alan Broadbent sends me an email of a new arrangement of my originals. Receiving different arrangements one after the other makes me feel like the richest man in the world; even wealthier than Bill Gates.